.NET Reflector was the first .NET tool to allow assemblies to be disassembled back into the high level language that produced them. Moreover, it has a plug-in architecture that allows you to disassemble to any language for which you have a plug-in, or are prepared to write one. Nick Harrison takes it one further step, and creates a plug-in that produces the CodeDom code needed to create the contents of the assembly. Nick explains, gently. Reflector does a wonderful job translating an Assembly into higher level languages. When you select “Disassemble”, this is what is happening in the background. The Metadata in the Assembly in translated to an appropriate representation in C# or VB or whatever languages you have installed. Reflector takes things a step further than this marvel, providing the mechanisms needed to add virtually any functionality that you find missing. This includes creating your own “language” to disassemble to. For our purposes, we will define a “Reflector Language” as a piece of code that converts an object from the Reflector object model into useful text. For C#, VB.Net, etc, these objects are translated into the textual representation that will produce the same metadata that was converted. Here we will step through creating a “Reflector Language” that will result in the CodeDom code needed to generate the code that was parsed. When creating a language from scratch you have to create the lexical analyzer and the parser. The lexical analyzer will separate a character string into valid tokens for your language. The parser assembles these tokens into something meaningful, based on the grammar for your language. We won’t have to worry about most of this. Reflector will present us with meaningful objects from the Reflector.CodeModel namespace based on the meta data from the Assembly being parsed. To build our “language”, we need to write code explaining what to do when each of these objects are encountered. We don’t really care about how Reflector determined that we have a ConditionStatement,; we simply focus on what our language needs to do when a ConditionStatement is found. There are a handful of objects that you will need to implement in order to define a language. Remember that an Add-in is just a class library. In our class library, we must provide an object implementing the Reflector.IPackage interface, the Reflector.CodeModel.ILanguage Interface, and the Reflector.CodeModel.ILanguageWriter interface. By themselves none of these are too difficult to implement. The ILanguage object has one method of interest. GetWriter will be called by Reflector as needed and allow us to associate an IFormatter and an ILanguageWriterConfiguration to our writer. The ILanguageWriter provides various methods that will be called by Reflector when different types of code are to be processed. As in life, the devil is in the details. Providing the details for how to process the various language structures is where the complexities come in. Language components are defined in terms of themselves. This is true for natural languages like English, French, and Spanish. It is also true for programming languages like C#, VB, and Java. This makes their definitions recursive. My father’s brother’s wife’s car etc. As prevalent as this is with Natural Languages, it is even more widespread with computer programming languages. 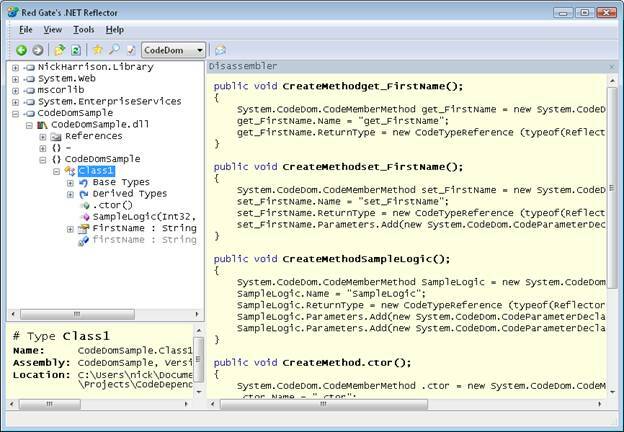 There are two main base Interfaces in the Reflector.CodeModel namespace, IStatement and IExpression. These show up widely in recursive definitions. For example, an IBinaryExpression is an IExpression with two properties, Left and Right. Both of these properties, are of type IExpression and can implement any interface derived from IExpression, including IBinaryExpression. This makes the definition recursive. This also means that while parsing nearly every language structure, you may also encounter nearly any language structure. The Visitor pattern makes it easier to deal with some of the complexities that can arise from the recursive nature of the language definitions. Instead of having to keep in mind every possibility when we encounter an IExpression, we can defer that responsibility to a more generalized VisitExpression and let it figure out the specific derived interface the object being visited implements. Instead of adding code to support the various types that you can encounter in each type, we can write the code for each type in its own method and then call the Visitor to “visit” every possibility for the derived types. Inside the switch statement, we handle the various values in the BinaryOperator enumeration. The key things to note here are the two calls to VisitExpression, the use of codeStack, and the call to MethodTarget BuildCodeString. The code stack allows us track context for what we are visiting. The CodeStackItem includes the name of the object that triggered the visitation (the ActiveBlock), the name of the property that we are visiting (the ActiveCollection), and an indicator for whether or not this is to be a collection or a single item (IsCollection). If value is not of the correct type, the as operator will return null. Each method will verify that null was not passed in adding marginal extra complexity to each method, but dramatically lowering the complexity of the VisitExpression. We use a similar method for VisitStatement and VisitType. MethodTarget is a property of type CodeStackItem that standardizes accessing the top item in the CodeStack. returnValue = ActiveBlock + "." + ActiveCollection + ".Add("
The WriteUnsupported method could be similar to this. Now you are free to implement the language features that are important to you. 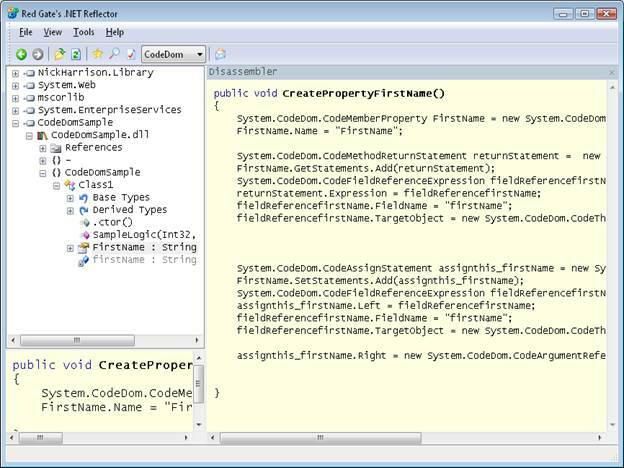 There are a couple of key things to note here, the use of a new class IndentedCodeBlock, the declaration of CodeDomTypes, and the call to VisitType to create the code necessary to initialize the data type for the property. VisitType is a function similar to the VisitExpression that we saw earlier. This method will be able to process type specification in all its forms. When dealing with one of the Declaration methods, we will be outputting a method that will produce the CodeDom code to create the corresponding object. In this case, we output the method CreateProperty<PropertyName>. We call VisitType passing in the context of the CodeMemberProperty and the Type property specifying that this is not a collection. We then call VisitMethodReference passing in the context of the CodeMemberProperty and the GetStatements and SetStatements specifying that these are collections. This will handle generating the details for the property implementation. The IndentedCodeBlock is a class that I borrowed from the implementation of the PowerShell language. It is a very simple class consisting of only a constructor and the Dispose method, but simplifies formatting our code. We use this class whenever our outputted code adds a level of indention. By declaring the IndentedCodeBlock in a using statement, we don’t have to worry about explicitly calling the dispose. The IndentedCodeBlock will go out of scope as soon as the using statement is out of context and the Dispose method will be called automatically. Called to write out a string with no special formatting. Called to write out a string formatted as a comment. This will generally be a light gray. These are not the comments from the original code but comments that the language added while translating. Called to write out the keywords in a declaration. Called to write out a new level of indentation in your code. Called to write out a Keyword. Called to write out a new line. This signals to the formatter that this is the end of one line and that futures calls should display text on a new line. Called when you need to write out a literal value such as a string, a number, a Boolean value, etc. Called to end the most recent level of indentation in your code. Here we showed how to create a language that will produce the CodeDom code to represent the code being disassembled. Other possibilities may include using this framework to create a language to provide static code analysis. You have the pieces needed to build a rules engine similar to FxCop. You could complain about methods with too many parameters. Warn about methods with too many conditional branches. Raise red flags when a switch statement does not include a “default”. You could also use this approach to build a language that would write stubs for your unit testing. As your language visits language structures such as an IConditionStatement, ISwitchCase, or IForEachStatement that would indicate the need for a new unit test, your language could output a comment describing the new test that would be needed. In the approach outlined here, we mainly used the Write and WriteLine methods. The other methods provided by IFormatter can be used to provide syntax highlighting for your language output. Using these methods will not add any functionality to our language or change its implementation, but it will improve the readability and look of your generated code. Also WriteComment can be used to add critiques of the code being parsed. Here is how our new language looks in Reflector. We load this add-in like we would an add-in. Once added, our “language” shows up in the language drop down. Creating your own Reflector language should not be seen as daunting task. 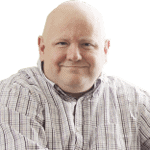 The goal is not to create a new industrial grade language and compete with C# and VB. The goal is to provide a new way to translate IL into something useful. Here we discussed examples of what you may do with your own language. As you get comfortable with these techniques, you will find more uses and new ways to have fun with a remarkable tool: .NET Reflector. Using the code dom is such a pain. Most of the time, you just wish to control some aspect of the generated code, therefore being able to start with a C# example of what you are trying to produce is great! I have created a project on CodePlex for anyone wishing to help flush out the missing functionality for this plug in. If you are interested in contributing, let me know and I can add you to the project. I like the idea. This is a wonderful concept and should make CodeDom much more accessible. I am not a big fan of the way you structured your VisitExpression method. There are a few problems here. First off you are calling every method when most likely only one will actually do anything. Another problem is that you have no way of generating an error message if a particular expression goes trough with out ever finding the correct method to call. Finally, there is also a problem if more than one method is be relevant. I have not looked through the objects in the Reflector.CodeModel namespace, but any object implementing multiple interfaces derived from IExpresson will have problems. Which Visitor should it call? Currently your code will call every method which is most likely not the intended behavior. Perhaps a better approach would be to load a hashtable keyed off of the type name. Populate the hashtable with delegates to the Visitor method corresponding to the key type. Index into the hashtable based on the type and invoke the correct method. If there is not a delegate for a given key, throw an error. If you load the hashtable with delegates as previously suggested, I don’t know that you will get the right index into the hashtable. The type is not really going to give you meaningful data since it is obfuscated. You can get the list of interfaces implemented, but how do you then know which one to use? The CodeDom code looks more confusing than the IL. You are supposed to translate the assembly into something useful. I don’t see any value added here at all. What can you do with the output from the translation? RE: So what do you do with this? The intention of the article is to show in general what is involved in creating a new “language” for Reflector to translate an assembly into. A fresh view for a translated assembly. The goal for this plug in specifically is to facilitate creating a code generator. Once this plug in is fully implemented, you will be able to immediately have a code generator to generate any code for which you already have an assembly for. The goal is that you will be able to use this as a starting point to building a useful generator on your own. From the translated code you will still need to load metadata and make appropriate changes based on the metadata. For instance change the name of a property based on the name of a column in a table. This may not be useful for everyone, but for anyone interested in code generation, this should be useful. Whether you are interested in code generation or not, hopefully you will find writing a language translator interesting.